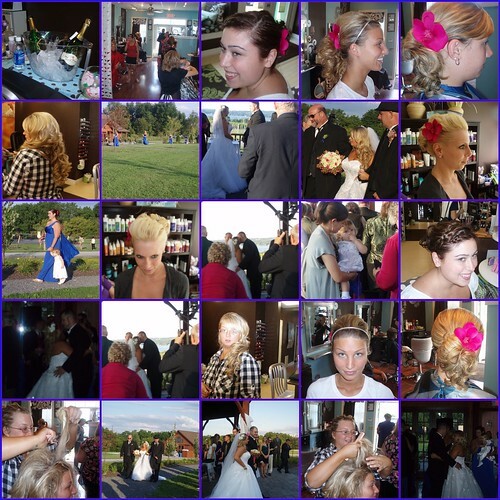 Bijou - A gem of a little salon in Skaneateles: Bijou girl gets married!! Samantha Mahoney got married on Saturday! Her new name is Samantha Mattice...I already ordered her new business cards! All of us Bijou employees were all welcomed at the lovely (super lovely) ceremony and reception at Anyela's vineyard! It was spectacular and to me, the best part was her Mom's speech, and the love that surrounded this family. All of us that attended, had touched hearts and tears in our eyes...It was a lovely ceremony and the whole afternoon spent with Sam's dearest friends and family was just so much fun! Everything was so fantastic, Balloons did the food (excellent!). Thea Folls did the flowers (fantastic!!) And of course Dina from Savoir Fare did the cake...it was glorious! A good time was had by all, (I'm still recovering from the fun;) and all the girls as beautiful as they look, they really were so great and fun!